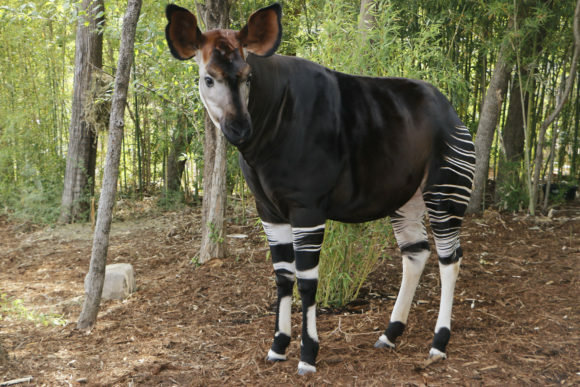 Meet our world renowned okapi herd | Dallas ZooHoo! 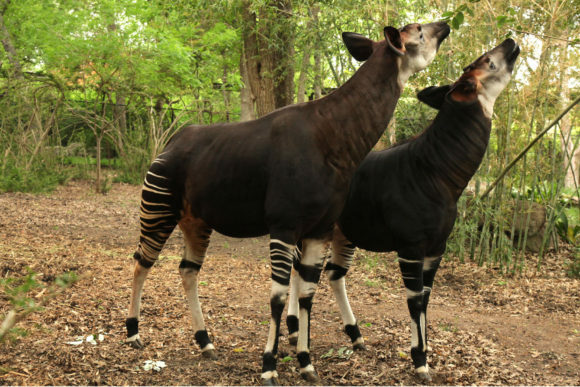 For the past 50 years, we’ve been working with the Association of Zoos & Aquariums (AZA) Okapi Species Survival Plan (SSP) to substantially increase the population of these endangered “African unicorns” in human care. Nearly 75 percent of all okapi in the SSP are related to Dallas Zoo offspring, and in our history we’ve welcomed 36 calves! Though they’ve been off exhibit during the construction of the Simmons Hippo Outpost, you can now view these solitary creatures in two different yards. 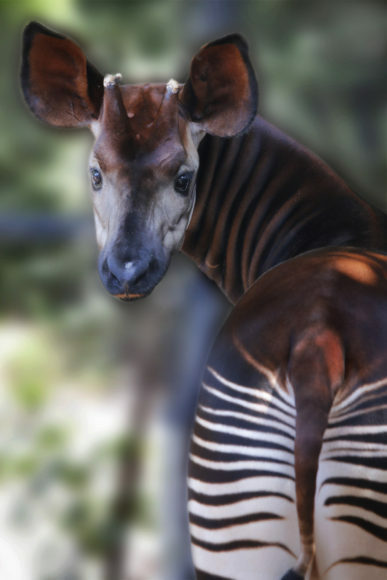 Learn about our six okapi and how to tell who’s who! Kwanini is a dedicated and attentive mother who was born at the Dallas Zoo when the Wilds of Africa originally opened. Nearly 27 years old, she’s given birth to 7 calves, including Ikenge, a son who still lives here. Although shy around other adult herd members, Kwanini is a caring, maternal figure. She enjoys interacting with calves and grooming them (and occasionally keepers) with her rough tongue. You can recognize Kwanini by her deep chocolate coloring and very defined brows. Niko was born at White Oak Conservation Center in Florida and arrived in 2000 at the age of three as a breeding male. His father was born in the Democratic Republic of Congo, making his genetics extremely valuable to the SSP. Since 2001, he’s fathered 7 calves. Known as the friendliest okapi ever encountered by our keepers, he’ll seek out the company of keepers and happily approach strangers for a head rub, which is atypical for this solitary species. In fact, Niko’s developed an interesting habit of bobbing his head at other animals and staff to get their attention. Niko is tall, dark, and handsome. He’s especially recognizable by his ossicones, which are only about 2 inches long because he likes rubbing them on trees and branches. Desi was born at Dallas Zoo in 1999, and is now almost 18 years old. She is currently our primary breeding female, and has birthed two calves. As the herd’s dominant, leading lady, the other okapi will submit to her—even the males! She is very comfortable and confident around keepers, and enjoys a good neck or ear rub. Desi learns very quickly and has been known to playfully test new staff members by not shifting (moving to a new space when asked) unless she is offered a treat. Though strong-willed, she’s a sweet girl. Look for Desi’s mahogany face and fuzzy fringe around her ears. Uche is 6 years old and will begin introductions with females this summer as an up-and-coming breeding male. 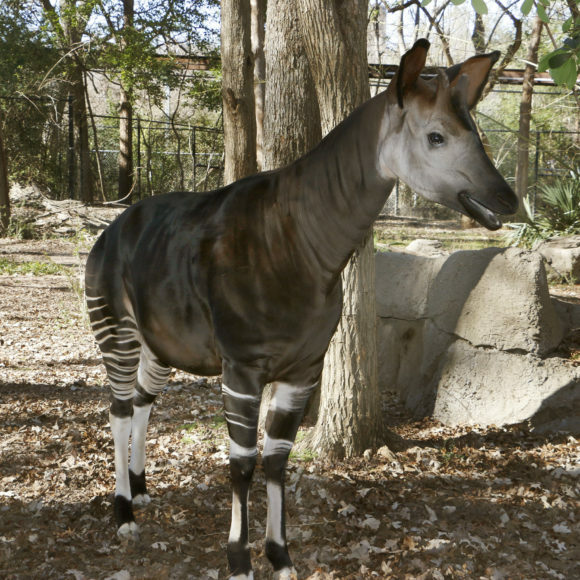 Born at San Diego Safari Park, he came to Dallas 3 years ago as Desi’s mate. He is often shy around female okapi, though enjoys saying howdy to them through stall windows. Upon first meeting, Uche appears aloof, but warms up quickly to familiar faces. When he first arrived, he was not fond of touching or direct feeding, but our keepers have earned his trust, and he now willfully approaches them to have his ears and ossicones scratched. He’s a quick learner with training, too. You’ll notice Uche’s very light face and thick ossicones. 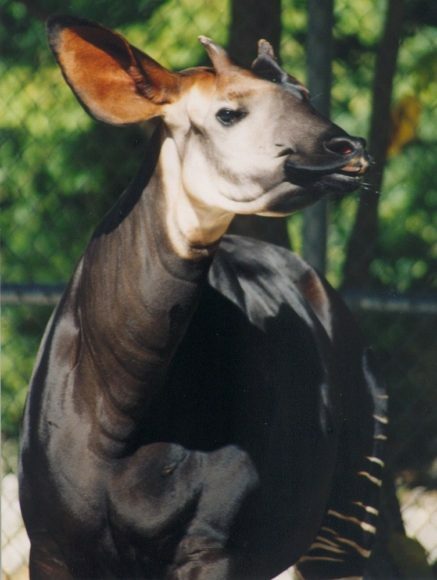 Still a rather young okapi, he is smaller than the other males and females. Ikenge was born at Dallas Zoo to mother Kwanini and father Niko. At only five years old, he’s still a little shy, but loving and playful nonetheless. When he isn’t visiting mom through the stalls, you’ll find him energetically running around the habitat. This little calf is very trusting and will follow keepers into new areas without hesitation. 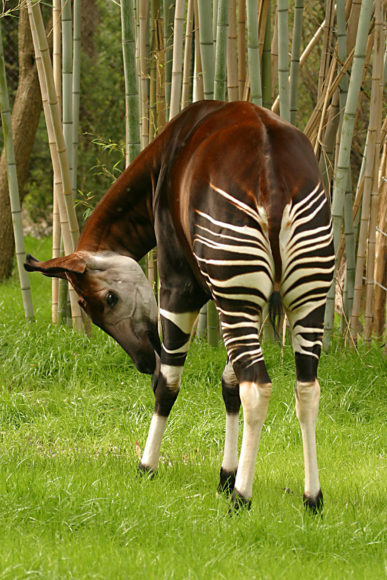 He appreciates being groomed by other okapi and his keepers, and enjoys training sessions and time out on exhibit. Although he is short, Ikenge is very muscular. Look for his dark face and long eyelashes. Kilua is the newest addition to our herd and our youngest. She was born in Cincinnati, but came to become a primary breeding female in the future. But don’t let her age fool you—Kilua is one of the largest okapi our keepers have ever seen. A gentle giant, she is both brave and friendly. Kilua likes to interact with people, and happily tolerates hoofwork. Though calm, she is still playful at heart and enjoys enrichment items, like her bamboo curtain and puzzle feeder. Kilua is huge, weighing in at nearly 800 lbs. With her massive frame, you’ll easily be able to identify her. Visit our okapi herd in person, and learn more about this unique species during an okapi keeper chat, occurring daily at 2:15 p.m. Most informative and interesting. Keep up the good work! There’s so much going on at the Dallas Zoo, we had to start a blog to tell you about it all. Have an idea for a story or a question for us? Email Info@DallasZoo.com and put “ZooHoo!” in the subject line.